2 Strokes Across America......... Vintage Guys on Vintage Bikes ! : Twenty Four Hours to Go! Some changes to the plan and a few thoughts. 2 Strokes Across America......... Vintage Guys on Vintage Bikes ! Jack Broomall and Don Verdiani are two experienced riders with the audacity to think that they can ride across the North American Continent on a pair of 1977 Hodaka motorcycles. Departing from the Philadelphia, PA area on June 12, 2011, they hope to arrive in tiny Athena, Oregon, in time to participate in the annual Hodaka Days reunion for the popular, but now defunct, motorcycle brand starting June 24th. Approximately 2800 miles in about two weeks aboard small displacement antique motorcycles! Twenty Four Hours to Go! Some changes to the plan and a few thoughts. Anyone who has spent time playing around with old two-strokes knows that they are treacherous devices. Lots of RPMs, marginal lubrication, and major thermal stresses are not the generally accepted formula for durability. Who knew, however, that we'd get burned by this witches brew before even getting out of the starting blocks? After several days of thrashing and a flurry of help and advice from two stroke and Hodaka enthusiasts around the country it all came down to the decision 48 hours ago that he wasn't going to be able to make the trip. An important contributing factor was that the 250 "Thunderdog" was one of the rarer Hodaka models and replacement bits are among the hardest to source. Outta time. Outta parts. Out of the ride! Truly unfortunate after all the prep work. I'll miss his companionship and humor on the road, and also the idea that he could rescue me if my bike decides to lay down on the job! So now this ride is a solo enterprise! One Stroke across America? Vintage Guy on Vintage Bike? And that 2800 miles seems just a little longer. Plus there will be no sharing of tools, spare parts, or expenses. It all has become just a bit tougher in many ways but that's the nature of these crazy adventures. I suppose I am as prepared as I can be in any case. Yesterday I took one last ride with everything completely packed and lashed to the bike. My "good" motor has been run-in over 300 miles (over 10% of the trip distance! )and I've ridden nearly 600 miles in total on both the primary bike and the spare. Both bikes, as well as my cache of "God I hope I'll never need any of this stuff" parts and spares are already staged at Martin Motorsports in Boyertown, PA for tomorrow morning's scheduled departure at 9:30AM. Trip Bike. Spares bike. Can you tell which is which? Now for a quiet day of cutting the lawn, catching up on the errands that have been deferred over the past few weeks and spending a short time working out the final details of route planning for the first couple of days. The time has come. It's here! Time spent on the road gives one time to ponder and one of the things I found myself thinking about, while droning along during all my road testing, is that being on a 70s bike is, in a way, like a time machine. The sounds, the smells, the tactile sensations all bring back a different time in a very real way. My 125 Wombat was manufactured in August, 1976 and subsequently sold/registered as a 1977 model. In 1977 Jimmy Carter had recently been elected President and the Reagan era was still three years away. There were no cell phones. The population of the US was not much over 200 million and there were about 150 million motor vehicles on the road. You boarded an airplane by simply presenting your ticket and walking on board. And small two stroke motorcycles were very common. We never planned to be "period correct" in every element of this ride. Prudence suggests that wearing the Steve McQueen era sweatshirt as safety gear might be taking things a bit too far. That doesn't mean that there is no desire to be "period correct". 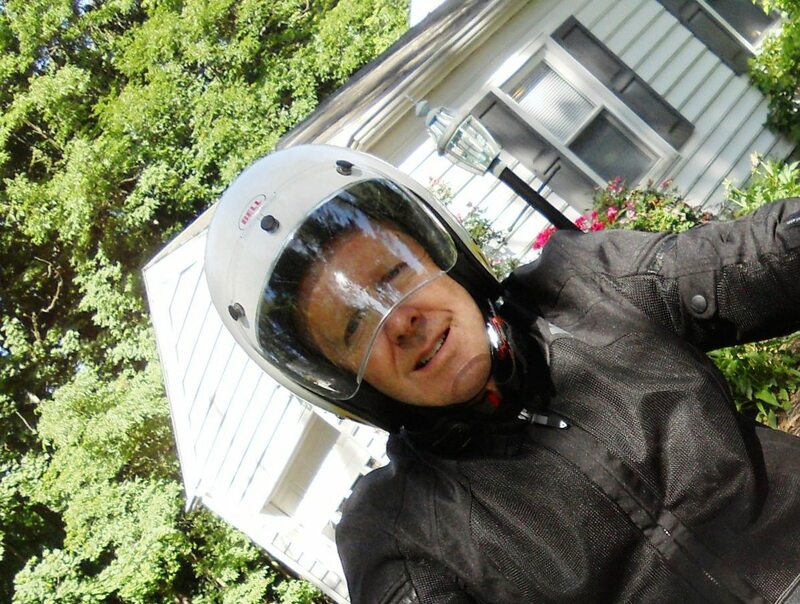 Aside from the bike, the most "correct" item in inventory is my Bell Custom 500 Helmet. Yup, the folks at Bell still make a "500." It's now DOT approved, available in several paint and color schemes, and is a very accurate reproduction of the piece that was the icon "back in the day." Bell Custom 500. DOT approved with that 70s look! I've even decorated mine with the same yellow and red segmented band that I carried on my Bell Helmets while riding and racing in the 70s and 80s. Makes me feel good. Throwback 70s paint scheme. Same as my Bell 500 "Back then!" The other thing that makes me feel good is this mix of 1977 hits that I'm currently listening to on my iPod. Remember some or all of those? So just about this time tomorrow I'll be hitting the road bound for Athena, Oregon. Where will I end up? Hopefully in Athena, but who knows. In any case it's already been a great adventure getting to the start line. I've gotten to play with toys for months now and I've gotten to go riding on my little "old crock" two stroke for some 600 miles! "Back in the day" that might have been a whole year's worth of riding. Now it's just a sampling. 2800 more miles lay in front of me. Trip odo set to zero. Off we go! Stay tuned. The really good stuff is about to begin! Sincere thanks to our supporters including Giant Loop Moto, REV’IT, Strictly Hodaka, Bell Helmets, Martin Motorsports. hey -- good luck ... am looking forward to meeting you in Athena!! hope you have a list of access people who are Hodaka folks across country to help you out as needed (hoping need will not arise) or just to show off to!! And then there were 4 days left! Can it be 5 days till departure? Strictly Hodaka - Your source for all things Hodaka! Martin Motorsports - Our Favorite Triumph, Kawasaki, Yamaha, and Suzuki Dealer. Sorry, No Hodakas!